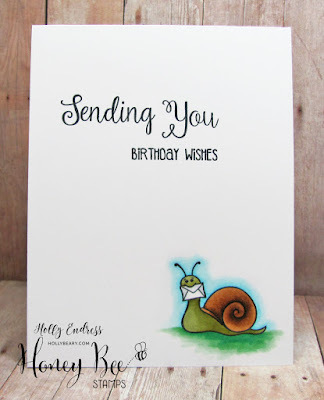 Hollybeary Creations : Happy Birthday!! I'm a little late with my post for yesterday... we are having internet issues. 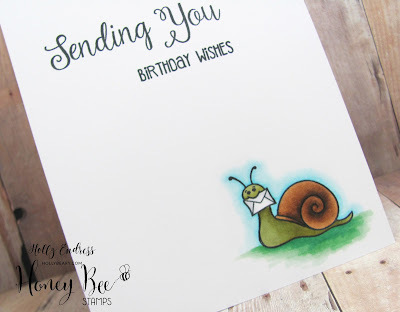 I was up on the Honey Bee Stamp Blog with a simple One layer card using the Special Delivery Set. I started with a top folding white card base, I used a piece of 110lb card stock so you don’t see the coloring from the back side. I stamped the images and the sentiment using some Memento Tuxedo Black ink. I colored the snail image in with Copics and added a ground and blue shadow around him. This helps make your image really pop off the page. The shadow can be down with Blues and Light Grays. These is a great way to fill your stash with quick Birthday or just a simple Hello card. Thanks for stopping by!